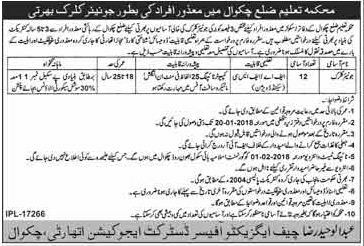 Education Department District Chakwal has announced Latest 12 Junior Clerk Jobs for Disabled Persons in daily Khabrain Newspaper 28 December 2017. Only Disabled candidates can apply for these posts. Candidates should be well Proficient in Operation MS Office and should have typing speed at least 25 WPM with minimum Qualification F.A or FSC (2nd division). As well as Disables Certificate is also necessary issued by Medical Board to apply for these Posts. Duly Completed Application should reach in office of the Chief Executive Officer, District Education Authority Chakwal before given date.